Adventure awaits onboard the Norwegian Cruise Line’s newest ship, the Norwegian Bliss. Featuring the revolutionary Observation Lounge, you’ll always have a place to relax and take in the stunning sights of the sea. From arctic glaciers to maritime wonders, witness it all while enjoying a full-service bar. 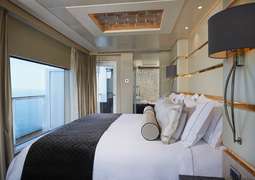 With a wide range of accommodation to suit your needs, its easy to create your ideal cruising experience onboard. The Norwegian Bliss is brimming with action packed activities for everyone to enjoy. If you’re up for a thrill look no further than the largest race track at sea, for children and adults to enjoy. Lounge by the pools and hot tubs while the kids have fun at the kids Aquapark. To truly unwind you can spend some time at the Spa, where you’ll find the Vitality pool and the Salt Room. With plenty of delicious culinary options, choose between a peaceful evening of seafood on The Waterfront, or a lively atmosphere while you dig into some authentic Texas BBQ. Themed Parties are held every night or kick back at a comedy show and enjoy a night of drinks and laughter. 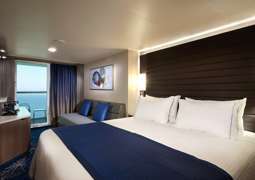 Norwegian Bliss offers a wide range of accommodation, ranging from Studio Cabins for solo travelers to Mini-Suites with large balconies. 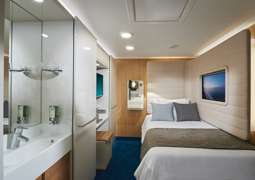 All of the cabins on board the Norwegian Bliss are designed to the highest standard and are accompanied with premium amenities to enhance the cruising experience. 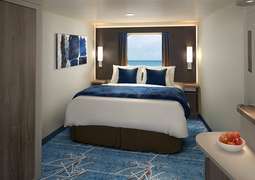 Whether you select an Inside Stateroom or a luxurious Mini-Suite, you'll always feel comfortable and valued on board the Norwegian Bliss. There is a vast array of dining and culinary options on board the Norwegian Bliss. You will be able to enjoy sumptuous meals and supreme beverages in one of the many specialty restaurants on board the Norwegian Bliss. Expert chefs will be delighted to offer their valued recommendations and serve up your deepest desires. Experience unrivaled entertainment options on board the Norwegian Bliss. You will be stunned by the enchanting views from the bridge in the 'Observation Lounge'. While passengers immerse themselves in the beauty of the outside world, they can relax and drink premium beverages at the 'Deluxe Bar'.